Celebrate AMC's hit zombie series with this Walking Dead Dog Tag Necklace! This stainless steel dog tag pendant features The Walking Dead logo and comes with another plastic dog tag that resembles dripping blood. Comes with a 22" ball chain. One size fits most. 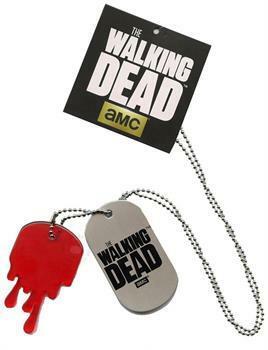 Celebrate AMC's hit zombie series with this Walking Dead Dog Tag Necklace! Stainless steel dog tag pendant features The Walking Dead logo and comes with another plastic dog tag that resembles dripping blood. Comes with a 22" ball chain.